Great chart this morning from Zero Hedge visually displaying how the big four central banks (Federal Reserve, European Central Bank, Bank of England and Bank of Japan) have pushed all in. The green line shows that the amount currency printed has now crossed $10 trillion. The currency they print is then used to purchase "assets" such as bonds. The average central bank interest rate sits at 0.75%. Central banks say that the economy is recovering strongly and they are confident about both employment and economic growth. Yet the actions shown below look like we are stuck in the middle of a global depression (hint: we are). 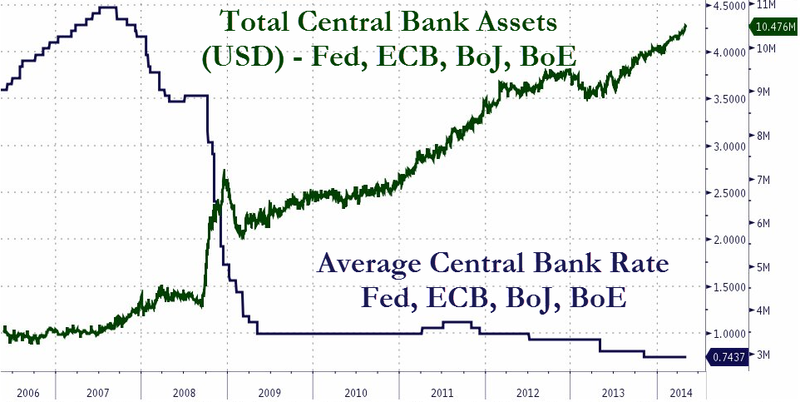 We have also been told the unwind of these programs, which would be selling the trillions of assets back into the market to mop up the liquidity and raising interest rates back to normal levels, will cause no major economic disturbances. My view is that the policies above are the equivalent of squeezing toothpaste from a tube. It is far more difficult to get the paste back in.